These are the awards for the champions in all divisions: CH Ram, CH Ewe, Breeders Flock, Best Headed, CH Skein, CH Fiber Art, CH Fleece, People’s Choice Photo. They will be awarded tonight at the BFL banquet at TJ’s Restaurant in Wooster, OH. 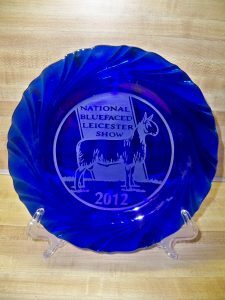 Plates are cobalt glass, engraved with the National Show logo, with a brass plate listing the sponsors of the award. Here are the sponsors of the awards for the national show. A BIG thank you for making these lovely awards possible!